Allie Schaich » RIO Advisors » Navigating Possibilities. Allie Schaich supports RIO Advisors’ research, analysis, and facilitation work. She works to turn conversations from interviews and facilitated meetings into actionable frameworks that enable clients to make progress on their goals. Her skills as a researcher, ability to perform thoughtful analysis, and contributions to facilitations help ensure that important client issues are framed in a way that drives productive conversations. 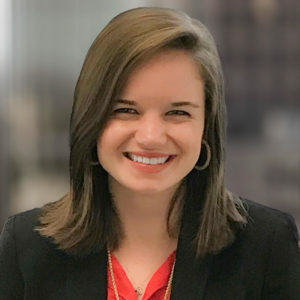 Allie previously worked for a boutique estate planning and employee benefits firm and is a graduate of Rice University. She volunteers with Houston Pets Alive! and is Social Chair of the Houston Area Women’s Center Young Leaders.